I’ve always been wary of people in a group. Somehow, being in a group can lead us humans to do appalling acts we would have been quite incapable of engaging in on our own. Perfectly nice people become bullies, and otherwise petty aggressors become outright criminals. This is why I always try to steer clear of people in groups on streets and in public transports and why I’ve never been totally at ease in a stadium. Recently, I’ve been painfully reminded about what hurtful consequences the “group effect” can also have in a playground and how an otherwise happy and confident child can be reduced to a unhappy and insecure one in just a few days of “group therapy”. Luckily, my son is still in an age where he tells me a lot of what goes on in school and I can still do some damage repair. However, I believe that anyone who’s been a target for bullying will remember it for life. I still recall the many times I sat huddled up in a corner of the playground hidden under my coat while my classmates made fun of my name… And yet, compared to what I see and hear about today, that’s nothing. I also remember with much shame a few episodes where I was the one “helping” with bullying someone. It doesn’t matter that I wasn’t the leader of the pack. Whether you’re in the pack or outside but not doing anything to stop it, it’s still terribly wrong and damaging. Peer pressure might be an explanation, but it’s never a viable excuse. The reason I’m writing all this? I received an invitation yesterday from a young girl I know to join a Facebook group. The group was directed against a schoolmate of hers. I have no idea who the targeted girl is but I can well imagine how the creation of this group has affected her because it affected me deeply. I suddenly got a preview of what kind of bullying my own child can become a victim of – or generate himself – within a very short time. And I find it frightening. The girl who sent me the hate group invitation is an otherwise intelligent and sweet girl, from a loving family – which is probably why her act shocked me even more. If she can do this kind of heartless and stupid thing without measuring the consequences, I can only imagine what those bullying my child in the playground today will be capable of doing online tomorrow. The worst thing about it? If or when it happens, I won’t be able to do as much as I’d like. Because the older he gets, the less I’ll be able to monitor his each and every move online and off. 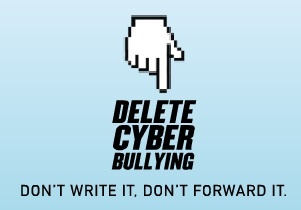 A recent UK study revealed that 50% of young people have been cyberbullied and 29% had told no one about it. An American study showed that cyberbullying victims were almost twice as likely to have attempted suicide compared to youth who had not experienced cyberbullying. There are so many, many things to protect your children from today and so many things to teach them. It’s no longer a question of not accepting sweets from a stranger, looking out for cars before crossing the street or saying no to drugs. Amongst many other new dangers, parents have to teach their children Internet safety and online behaviour too – and let’s be honest, many of us don’t respect – or understand – a lot of this ourselves. To the girl who sent me that Facebook invitation and to the ones who joined her group, I would however like to repeat what my parents taught me long before Internet was invented and what I in turn tell my own son very often: Always treat others the way you want to be treated. It may be ancient advice, but it works in cyberspace too.